Discover how you can say goodbye to ‘sagging skin’ and unsightly lines around the neck in an instant. At NeckTITE Magic, we provide you with an instant solution to your lines and sagging skin around your neck. Consider this as an instant and cost-effective solution every time you want to look good and youthful. When you order our magic strip box you will be provided with strips that can be used for 16 days which you can use anytime, for any occasion. Use our product an hour before your planned dinner date, for a meeting or an important event. 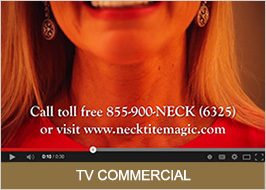 By checking our NeckTITE Magic TV Commercial, you’ll be given a general picture on how you can use our product. Our product is easy to use and delivers the youthful result in just one easy application. An application can deliver results that can last for a day. Once the application has been completed, you can simply throw away your product. Check out our 30-second commercial to learn more about our product and see the youthful difference the next time you step out of your door. We have provided application tips that you can follow to get maximum results. To order or if you have other questions, don’t hesitate to call 855-900-NECK (6325) toll-free. Or you can send us a message at info@necktitemagic.com.